A leading cause of bridge failure is bridge scour, which occurs when rapidly moving water erodes riverbed soil around abutments or piers. Monitoring bridge scour with traditional inspection methods can be dangerous and difficult, so MnDOT has been working with researchers from the University of Minnesota’s St. Anthony Falls Laboratory to develop a continuous monitoring system to test certain bridges more safely and efficiently. MnDOT currently monitors 45 scour-critical bridges — and local Minnesota agencies monitor 360 more — using visual inspections or water data websites during flooding events. Once a predetermined threshold is exceeded, portable scour monitoring equipment is deployed to measure scour depth. If scour has undermined the foundations of a bridge, inspectors close it for repair. But portable scour monitoring systems can be difficult and dangerous to deploy from the bridge deck or boat in fast-moving water. It can also be difficult to get inspectors to sites quickly enough in areas subject to flash flooding. A better alternative for such situations are fixed scour monitoring devices that continuously monitor scour and send data wirelessly to bridge personnel, alerting them when scour reaches a dangerous level. The Highway 43 Bridge in Winona was affixed with continuous bridge scour monitoring equipment. Researchers have installed fixed remote monitoring stations on four such bridges. Stations on the first two bridges (Highway 14 over the Minnesota River in Mankato and Highway 43 at the Mississippi River in Winona, pictured at top) ran successfully for three years, with outages due to primarily to power and communication issues. 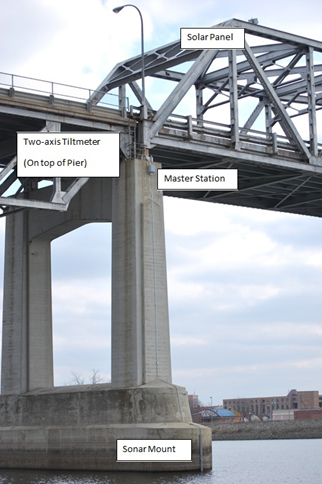 Researchers learned valuable lessons from these bridges and have now installed monitoring equipment on two more: The Old Hastings Bridge (Highway 61 over the Mississippi River), on which float-outs were installed; and the Dresbach Bridge (Interstate-90 over the Mississippi River), which had a tilt meter and underwater sonar device installed. *Editor’s note: This article was adapted from an article in the latest issue of our newsletter, Accelerator. Read it online, or sign up to receive it by mail.